What is Tinea of the Foot / Tinea Pedis? Tinea is a contagious fungal infection of the skin. “Pedis” is the Latin term for the foot, and so tinea pedis refers to the fungal infection being present on the feet. This fungus can affect other areas of the body such as the groin, scalp and underneath tissue folds such as the breasts. As with all fungi, tinea needs warm, moist areas to thrive. This explains why the fungus commonly affects the hot, dark, clammy areas of the body. How is Tinea of the Foot Spread? Tinea is often spread by skin-to-skin contact or indirectly through floors, towels and clothing. It is very easily spread in communal locker rooms and showers which are constantly moist. As such, they provide a great environment for the fungal spores to prosper. Unlike other organisms such as viruses, fungal reproductive spores can last a long time on surfaces without a ‘host’ body to support them. This is especially true in damp areas which is why showers and pools often get the blame for spreading the condition. What are Symptoms of Tinea of the Foot? 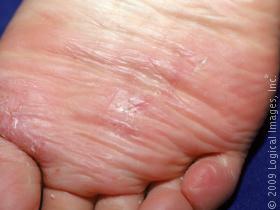 It might also appear as a lesser, ‘low-grade’ infection where there is just a red flare to the affected skin. This low grade irritation can be more problematic than an acute flare up. The skin can become dry, cracked and painful. Drying the feet well after showering. Focus particularly on the spaces in between the toes. Allow some ‘air-time’ after a shower. This allows the moisture in the skin to evaporate. Wear socks made from natural fibres rather than synthetic socks. Go Hi-Tech and use socks with copper thread. Fungus and bacteria cannot live on this material and these are a great choice for stubborn problems. They are available at our clinics. Use antiperspirants to stop excessive sweating. This is not the same as a deodorant which only cover up smells. Antiperspirants contain chemicals which cause the sweat glands to ‘pucker-up’ and reduce the amount of sweat that they excrete. Antiperspirants suitable for this purpose must contain Aluminium salts and be a spray on. Roll-on types will become a gummy mess in your shoes. Wear thongs in change rooms, communal showers and around swimming pools where your feet might encounter bugs that have been left by those before you. Treating your tinea straight away with anti-fungal topical preparations. Treat until symptoms are no longer present PLUS seven days more. Washing your hands after touching the infected area. Making sure to not walk around barefoot and infecting others.Cleaning the shower, bath and bathroom floor after use. Treating the inside of your shoes with anti-fungal sprays or powders. Washing socks after each wear and drying in the hot sun when possible. 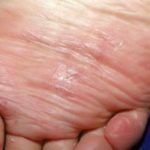 How Can Tinea Be Treated? Tinea infections can easily be identified and treated by a podiatrist. At Walk Without Pain we choose to stock Calmogen which is a very effective treatment. We especially like this product as it is different to every other commercially available anti-fungal application. If you have tried other treatments without success, it is worth giving Calmogen a try.